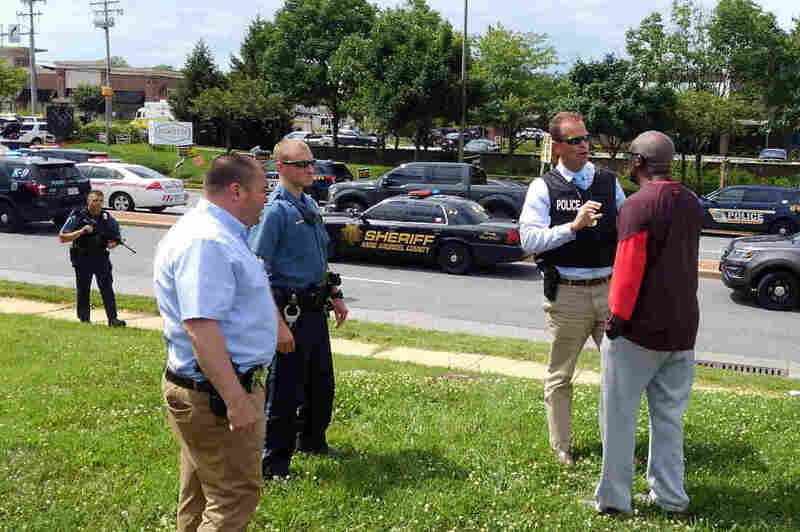 Capital Gazette Newsroom Shooting That Left 5 Dead Was 'Targeted Attack' The suspect, identified as Jarrod W. Ramos, 38, reportedly has had a long-standing feud with The Capital newspaper for its coverage of a 2011 criminal harassment complaint against him. Police officers respond to a shooting at the Capital Gazette newsroom in Annapolis, Md., on Thursday. 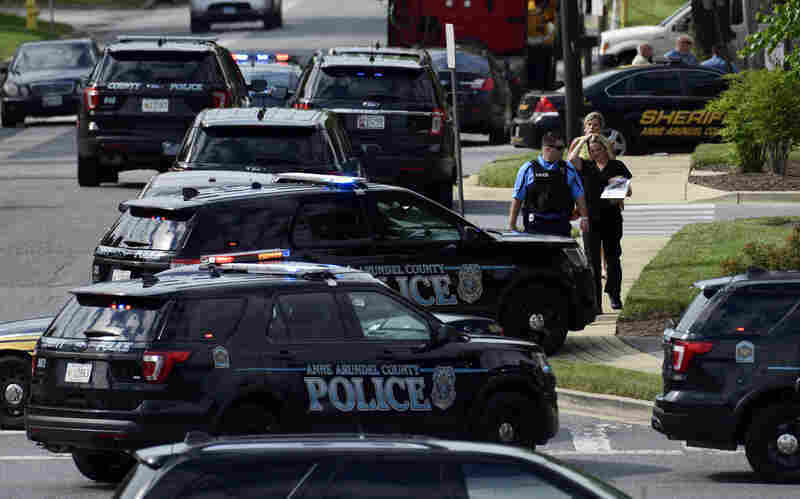 Five people were killed and at least two others were wounded in a shooting at the Capital Gazette newsroom in Annapolis, Md., officials announced at a news conference Thursday afternoon. Acting Anne Arundel County Police Chief William Krampf confirmed an adult male is in custody and was being interrogated by law enforcement. Law enforcement officials have identified the suspect as 38-year-old Jarrod Warren Ramos. He reportedly has had a long-standing feud with The Capital newspaper, one of the Capital Gazette's publications, over its coverage of a 2011 criminal harassment complaint against him. Ramos has been charged with five counts of first-degree murder. At a news conference Thursday, Krampf said the suspect used a shotgun and had smoke grenades. "This was a targeted attack," he said. The newspaper had received threats through social media on Thursday, according to Krampf, who would describe them only as "general threats toward the Capital" that "indicated violence." Police are working to confirm who sent the threats. Authorities apprehended the shooting suspect, a Maryland resident, without any exchange of gunfire, Krampf said. On Thursday night, Anne Arundel officials released the names of the employees killed in the shooting at the Capital Gazette newsroom: Rebecca Smith, sales assistant; Gerald Fischman, editorial page editor; Wendi Winters, special publications editor; John McNamara, staff writer; and Robert Hiaasen, an assistant editor and columnist. In a Facebook post Hiassen's brother Carl, a renowned novelist, described Robert as "one of the most gentle and funny people I've ever known." County Executive Steven Schuh told CNN four of the victims' bodies were found on the floor of the newsroom and a fifth person — a woman with severe wounds to her upper body — died after being evacuated to the University of Maryland's Shock Trauma Center. At least two other wounded people "with less severe injuries" are being treated at Anne Arundel Medical Center, Schuh said. It is unclear whether the shooting was limited to the newsroom or the gunman attacked people on other floors. Krampf said his department interacts every day with the newspaper as it is the local paper for the county. "We're here, we're invested, we're going to get this investigation right," he said. Capital Gazette reporter Phil Davis shared details on Twitter, writing: "Gunman shot through the glass door to the office and opened fire on multiple employees." Anthony Messenger, an intern in the newsroom, first tweeted about the shooting at 2:43 p.m. ET, writing, "Active shooter 888 Bestgate please help us." Anne Arundel County Police spokesman Lt. Ryan Frashure confirmed that authorities arrived on the scene within 60 seconds of receiving a call about the shooting. Annapolis Mayor Gavin Buckley praised law enforcement for its response, saying that if officers "were not there as quickly as they were it could have been a lot worse." Police worked to secure the scene of a shooting at the building housing the Capital Gazette newsroom Thursday. Authorities say at least five people were killed. The Capital Gazette's website lists 20 newsroom employees. Frashure said during the news conference that law enforcement from Annapolis, nearby Howard County, the Maryland State Police and federal agencies were participating in the response. He said authorities were focused on clearing the building and reuniting the people inside with their families. Families should go to the Lord & Taylor outlet at the nearby Annapolis Mall, he said. Gov. Larry Hogan tweeted he was "absolutely devastated to learn of this tragedy," adding that he is in contact with authorities on the scene. President Trump also tweeted about the incident, saying he had been "briefed on the shooting at Capital Gazette," and he offered "thoughts and prayers." Despite the tragic shooting, the newsroom's staff defiantly put out the Friday edition of the Capital. It also tweeted "Yes, we're putting out a damn paper tomorrow" along with a shot of its front page headline: "5 shot dead at The Capital."